Our happy and excited Pilgrims landed in the beautiful and modern airport in Mexico City, Mexico. We boarded our bus and headed through the countryside to our Hacienda where we had a wonderful outdoor dinner and Mass. From Queretaro Mexico to San Miguel de Allende - Amazing Day! Our 2nd day in Mexico has been remarkable. I think everyone is surprised by the beauty and friendliness and safety and Catholic spirituality of this amazing country. Fr. Mark Seiker’s homily here. Enjoy today’s video! Wow, what a beautiful and amazing spiritual country. The churches we are visiting are beyond description. Hope you enjoy the homily and the video of our adventures today. Join us on this fun drive across Mexico to the beautiful city of Puebla. For our homily from Fr. Mark at San Francesco in San Miguel click here. Cathedral, Mass at Tomb of Incorruptible, cooking class and much more. For homily at Incorruptible click here. An amazing day in Mexico. We renewed our baptisms in the first baptismal font ever in the Americas. We also saw the first pulpit where the gospel was first preached in the Western Hemisphere. We ate in the belly of a cave and part of our dinner was ant eggs and larva. Then we climbed the Pyramids of the Sun and of the Moon which were built 2000 years ago. Then we arrived in Mexico City. I would highly recommend you listen to the homily of Deacon Dave as he speaks about our heritage is Catholics in the meaning of baptism in this video also includes the renewal of our baptismal vows from the first baptismal font ever in the Western Hemisphere. Today we visited the Aztec Temple in Mexico City. The cathedral of Mexico City was built right next to the 500 year temple. I did a lot of study on the Aztecs and their massive human sacrifices and cannibalism. I realized there was a great tie-in with the Catholic faith, the sacrifice of Christ and abortion. I did not get enough time to finish the video of today’s adventures but I will have it up by tomorrow. Stay tuned. <img class=”alignright size-medium wp-image-1593509″ src=”https://www.catholicconvert.com/wp-content/uploads/IMG_4332-300×225.jpg” alt=”IMG_4332″ width=”300″ height=”225″ />Today we visited the Aztec Temple in the heart of Mexico City next door to the Catholic Cathedral. Tens of thousands of humans were brutally sacrificed and even eaten. I gave a talk (see earlier video) contrasting the sacrifice of Christ and that of the Aztecs – and abortion. Mass at the exquisite and meaningful Church Our Lady of the Pillar. Homily here. Also “debated” Diego Rivera (Spanish muralist) in the Palace of Fine Arts” based on his mural “Man, Controller of the Universe. Lots more too. Enjoy! Join us as we tour the whole shrine and grounds of Guadalupe along with a special Mass in front of the Tilma of Our Lady. Amazing climb to the top of Tepeyac Hill where Our Lady appeared to St. Juan Diego. For the homily in front of the image of Guadalupe, click here. Enjoy our last day of Mexico Adventures. Homily in tiny Indian chapel in middle of the marketplace here. 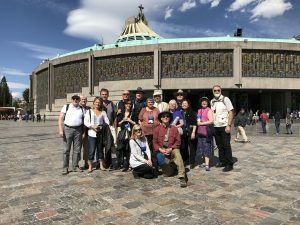 We just finished our first “Catholic Heritage of Mexico” and here are some of the comments and reflections on the trip. We had a thousand compliments and not one complaint. Enjoy! One of the three great Marian apparitions, Guadalupe is OURS, centering on the Western hemisphere. We will spend a whole day in Guadalupe with a guided tour and Mass in the morning with the afternoon free to pray and explore. This is a 10-day exciting, jam-packed pilgrimage and tour of Mexico. Not just a few days at Guadalupe! Explore and immerse yourself in the amazing faith of the Mexican people. It would be a shame to come all the way down to Mexico City and not see everything else this amazing country has to offer Catholic pilgrims. We will spend time seeing the sites in the city with Mass at the cathedral, seeing the old Aztec Temples and discussing their religion of human sacrifice, relating it our own culture today. We will also travel into the countryside to visit the ancient pyramids, renew baptismal vows in the oldest baptismal font in the Americas that goes back to Cortez. Visiting San Miguel and the beautiful countryside and the historical churches. We will discuss at length the suffering and trials of the Mexican Catholics and the impact of the Cristeros. Boats on teh canals, arguing with the atheistic murals of Diego Rivera, walking through exotic markets, taking cooking lessons and eating the finest food Mexico has to offer. This is a safe trip. The areas we tour are wonderful, free of danger and clean and friendly. Full brochure with itinerary, pricing and registration info coming soon. Contact Suzanne above for immediate information and to be put on the list. For on-line registration, click HERE.